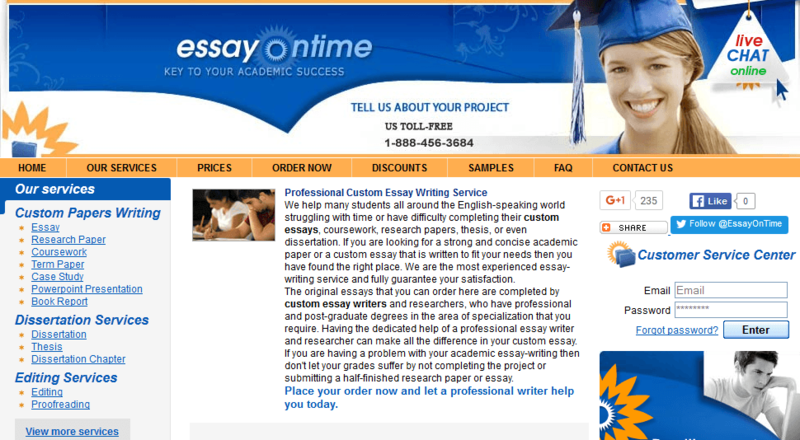 EssayOnTime.com is an online academic writing service, the age of which is not known. The landing page has very little information and there is no “About Us” page that speaks to the company’s origins, its mission, and so forth. This review, then is written based upon what we have been able to discover through navigation of every page of the site, from the Essay on Time testimonials published on the site itself. We have further sought customer feedback and comments elsewhere on the web and have included those in our overall report. As well, we placed a “test” order for an undergraduate research paper to determine quality of product. All of these factors combined allow us to provide an Essay on Time rating of Fair to Good. The company advertises its services through a link at the top of its home page. Here, we found a short list of categories; however, when we clicked on any of them we were taken to another page which provides all of the details of writing genres – essays, term/research papers, case studies, lab reports articles and book/movie reviews, coursework assignments, research projects, theses and dissertations. It also offers admissions essays, as well as editing. In this respect, the service functions as most others. Interestingly, the company states that a team of three individuals is involved in each piece, at least those that require research. One individual will conduct the research, one will produce the writing, and a third will proofread the final product. We would have concerns with a separate researcher and writer, for, often, it is through the research that a writer begins to develop a solid thesis and an idea of organizational structure. To have these functions separate is highly inefficient at best. To determine our rating on quality, we relied upon EssayOnTime customer reviews both on the website and elsewhere on the web. As well we studied the samples available on the site and, as well, the quality of the paper we ordered. Customer reviews are positive in terms of writing quality, meeting of deadlines, and communication with customer service and with a writer. The two samples products on the site consisted of a research essay and a Ph.D. level research proposal (although it was titled a research paper). In both instances, there were errors in grammar and word usage, which indicated to us that non-native English speaking writers are being used. For example, the term “researches” was used as the plural of “research.” In fact the singular and plural are both the same word. In other instances, sentence structures were not correct. The other concern was the dates of the resources used. The research essay was on stem cell research, and no resource later than 2008 was used. In the case of the Ph.D. work, the latest source was dated 2006 and it discussed mergers and acquisitions relative to globalization. A lot has happened since then. The research paper we ordered from Essay on Time was adequately produced, and the organizational structure was sound. Resources were a bit more current, although our specific instructions were for journal articles no older than 2010. It was delivered on time and formatted as we specified. In all, we can state that EssayOnTime is not a scam. 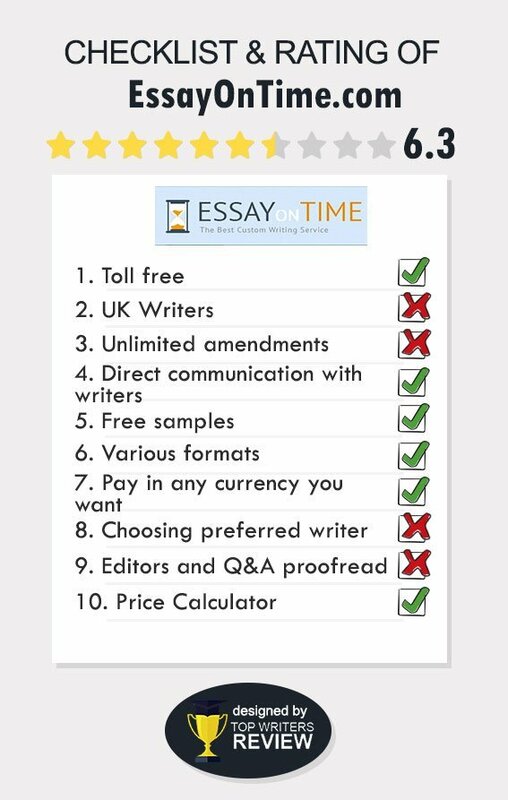 EssayOnTime.com prices range from $21.99 per page at the high school level to $22.99 for thesis and dissertation research and writing. This is not a wide difference; however, the deadlines create a much wider differentiation. Admissions Services begin at $20.99 and editing at $7.49 per page. There are also no differentiations for researched and non-researched works or for number of resources required. We find this odd. The price of our paper (8-page research paper at the undergraduate level with 4 resources) came to $183.92, before our new customer discount, a bit pricier than comparable services. The company accepts all major credit cards and PayPal, although we were not told this until we reached the checkout page.The payment process is SSL secured. New customers receive a 25% discount, which is quite good, and there is an Essay on Time promo code for this. Additional discounts kick in after cumulative 15 pages. 16-50 = 5% discount; 51-100 pages = 10% discount, and 101+ = a permanent 15% discount. We did not find any EssayOnTime.com coupon codes or indication that these were offered. Free title page, bibliography, revisions and an essay writing guide are provided with orders. In terms of EssayOnTime.com pros & cons, we would state the following: The company provides good services and fair-good quality. It meets deadlines and customers appear pleased. Concerns for writing quality and resource use exist. EssayOnTime BBB membership indicates no serious complaints. They did deliver my order on time and I`m really grateful for that. But the quality of writing is not up to par and has nothing to do with the price I paid. There were quite a number of mistakes, lots of typos and clearly, they don`t care about formatting at all. The website is ok and the support service was friendly and helpful. I worked with this service twice. My first essay from them was not that bad. It was of the right format, had all the necessary citations and no major mistakes. The price was a bit too high though. Then I had to submit another essay as soon as possible and I remembered about these guys. My second paper was 3-days later than I expected and it was poorly written. I am really in two minds. That`s not the top-best resource for papers from scratch that I know. However, in case of urgency, they might be helpful with their services. But I was getting premium level of services for additional %. Mediocre. That`s the best word for this service. They deliver on time but the quality of writing is not up to par.